This is the sourt of soup that I like! Vet du, jag kan inte betsämma mig för om jag skall komentera på svenska eller engelska här. Jag kommer nog att göra bådadera, beroende på omständigheterna. 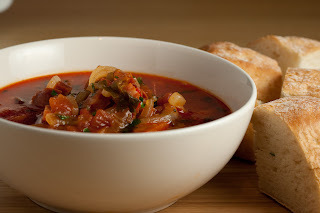 love soup, i have a somewhat similar recipe.. soup rocks! I agree with you. It's a shame that people don't eat more soup - most people don't see it as a proper lunch/dinner. They see it as a starter and nothing more. Hmm chorizo goes with pretty much Anything! Yummy! Yeah, you're right there. Chorizo is a good base for many a good dish. OMG... thank you sooo much. I've been cooking this soup a couple times and my famlily loves it but somehouse lost the recipe and my brain is not helping much lolz... it's exactly the one recipe I'm looking for. I'm so happy that you found the recipe you were looking for. I'm cooking this tonight... Smells divine. Greetings from South AFrica!